The homogenising character of the Ottoman Empire, and later of the Turkish Republic, was expressed in efforts to forcefully assimilate deviations from the Turkish-Sunni Islam hegemony; as a result, groups outside of the paradigm Turk-Turkish-Sunni-Islam such as the Alevis could not develop a common political consciousness. Because of new political conditions and the government’s interest in meeting the European Union’s prerequisites for membership, many minority groups in Turkey began to discover new aspects of their identity. For the Alevis, the massacre of 33 Alevi intellectuals in the Anatolian Province of Sivas on 2 July 1993 served as a start to discuss their religious and cultural identity beyond immediate political issues: catalyst for “Alevi Revival” (Kaplan 2009: 161). With time, they became aware of the additional challenges resulting from the lack of a clear definition of Alevism’s religious aspects, and the heterogenity created by different forms of Alevism. During the Ottoman Empire, Alevis and other oppressed ethnic groups unsuccessfully rose up against the hegemonic state (Baba-Ilyas 13th century, Sheich Bedreddin 15th century, Pir Sultan Abdal 16th century, etc.). Also, the Turkish Republic is marked by massacres of Alevis and other ethnic groups (Dersim 1938, Maraş 1978, Malatya 1978, Çorum 1980, Sivas 1993, Gazi Mahallesi 1995). Alevis fear new massacres in the future. Due to their non-Sunni identity, the Alevis have been facing discrimination for centuries. However, those Alevis who also have other non-Turkish identities face multiple exclusions and disadvantages in a republic characterised by the Turkish and Sunni-Islam synthesis (Seufert 1997: 182ff and Kaner 1998: 45fff). The few existing literary sources on this orally transmitted faith are dominated by political interests seeking to reduce and assimilate Alevism to a kind of Turkish culture (Johanson 1988: 55 and Leiser 1988: 116fff). This position fundamentally challenges the strong influence of Arabic İslam. On the scholarly level, this approach is represented by. Ahmet Yaşar Ocak and Irene Melikoff. For example, Izzettin Doğan forcefully advocates that position within his state-supported Cem Foundation (Turkish: Cem Vakfı) in Turkey. The heterogeneous character of Alevism with regard to its various ethnicities has been ignored for a very long time. The historian Hans Lukas Kieser from Switzerland clearly points to a difference between the western Alevis and the eastern Alevis in Anatolia (Kieser 2001). More and more research reveals that the Alevi groups have widely diverse ethnic identifications (Brubarker 2010) and religious rituals. Currently, most international scholars acknowledge the heterogeneous character of Alevism. It is important to emphasise that many different groups which are often counted among “the Alevis” live in the Balkans, the Middle East, and in different parts of Asia. However, they distinguish themselves from each other on many different points and have completely different religious practices and views of Islam. The Anatolian Alevis are different than the Nuṣayrī (also called the “Arab-Alevis” or just Alawis; Alawīyyah) and also the Jaferi also called “Imami Shiites”). This paper concentrates on the Anatolian Alevis in Turkey and in the European diaspora and it particularly deals with the situation of the Zazaki- and Kurmanci-speaking Alevis in eastern Anatolia due to their non-Sunni confession, non-Turk ethnicity and non-Turkish first language in the Republic of Turkey. This paper emphasises the special feature of the Alevis and Alevism from and in Dersim, which is a historical region in eastern Anatolia and generally accepted as the stronghold of the eastern Anatolian Alevis. The Dersim population is almost entirely of Alevi origin. The Dersim Alevis maintain the pagan and pantheistic elements of Alevism, which deeply connects to a space as if time has never passed; this forms a distinctive typology of the Alevism in that region. This analysis will focus on their special form of Alevism, their position to and within the Kurdish national movement and their possibilities for establishing their own identity regarding their ethnicity, language and belief. Due to political and economic conditions, many eastern Anatolian Alevis emigrated into the diaspora. Furthermore, important Alevi organisations in the European diaspora now try to influence their homeland. These points will be considered in regards to the political influence of the European Alevi diaspora associations and their demands for democratic rights in their homelands. The research of the linguist Mesut Keskin has revealed that if people in eastern Anatolia, in particular northern Dersim and Erzincan say “I am Kırmanc”, they mean that they are Alevi and Zaza and there is no direct connection to the word “Kurmanc”, which points to the northern Kurdish dialect or Kurdish ethnicity (Interview Mesut Keskin 30.10.2015). Alevis from Erzurum (Tekman, Hınıs) and Varto, for example, call themselves “Şarê Ma” (Englisch: Our People), while Kurmanci-speaking Alevis from Sivas (Karabel, Divriği, Ulaş, Kangal) call themselves “Zaza” to clearly distinguish themselves from the neighbouring Sunni Kurds. Kehl-Bodrogi writes, that while in Eastern-Turkey the ascriptions “Sunni” and “Kurd” are used synonymously in West-Turkey “Sunni” and “Turk” are used synonymously (Kehl-Bodrogi 1998: 117-118). Sometimes Sunni-Zaza are named Zaza or Dılmıc and the Sunni Kurds Khurr or Khurmanc and the Alevi–Kurds Kırdaşi by the Alevi-Zaza in the north (Keskin 2016). Alevi Zaza make a difference between the Sunni Zaza and the Alevi Zaza and argue that Zaza of South and North “(…) talk the same language and are highly likely of the same heritage, but the difference in Sunni and Alevi reasoned the creation of two different folks in history, the Kırmanc and the Zaza” (Cengiz 1991: 1; translation Z.A. ; see also Kehl-Bodrogi 1998: 127). Due to the strong and expanding Kurdish national movement, a big debate has emerged on the ethnic background of the Dersim population. Also, according to the outcomes of the First Zazaki Conference in Vienna on 18 December 2015, linguists agree that the membership to a nationality is a political decision and does not implicitly contain direct connections to the first language or mother tongue that one speaks. With the respect to ongoing discussions over ethno-linguistic identity, this paper refers to the Zazaki and Kurmanci-speaking Alevis in Dersim rather than Kurdish Alevis. In surveys, most of the Dersim population say that they are Alevis in belief and Zazaki in language. Kieser points out that the Anatolian Alevis were strongly repressed during the Ottoman Empire, above all in the 15th and 16th century. Above all the time period between the 13th and 16th century signs the growing of the power of the orthodox Sunni Islam and institutionalization of it within the state bureaucracy. The opposition to the Ottoman repression and the socio-political context (influence of the Persian Empire under Shah Ismail upon the region and attempted solidarity with Christian Armenians) resulted in big socio-political distinctions between the western and eastern Anatolian Alevis. Above all, Sultan Abdulhamid II practiced an anti-Alevi (who hve been seen as incomplete Muslims or faithless depending on political context; see Mertcan 2012), anti-Armenian and anti-Protestant–missionary Sunnitising politics in eastern Anatolia in the 19th century. Due to their critical and distant position against the local Sunni rulers and the central Ottoman Empire, the eastern Anatolian Alevis developed solidarity with their Armenian neighbours (Kieser 2001). Above all, the elderly Kırmanc (Alevi Zaza) talk about common celebrations with their Armenian neighbours and interreligious and intercultural weddings. We do not really know and have any respective data about the role of the Alevi in the Armenian Genozide yet, but to flee the 1915 genocide, many Armenians converted to Alevism and engaged with the Kırmanc. While Armenian churches now exist only as ruins and many Armenian houses are inhabited by the Kırmanc, people in the region still tell stories about and even search for buried Armenian gold. Within the Turkish Republic and the growing left-wing political movements in the 1970s, Dersim was exceptionally described as the place of people defined by three Ks “Komünist, Kızılbaş, Kürt” (English: “Communist, Qizilbash, Kurd”) (Bumke 1979: 544). In the 1990s, the guerrilla fighters of the Kurdish PKK launched their campaign from the Munzur mountains in Dersim. During those years, some parts of Dersim were under an official state of emergency. Next to the influence of the Turkish socialist movement in the 1970s in Dersim, the Kurdish movement had an important impact on the region. Above all, the generation born in the 1990s show stronger sympathy to the Kurdish movement. The stronger Shīʿah Islam influence amongst the eastern Anatolian Alevi and the historical contact with the Persian Empire helped cause these Alevis to strongly maintain the pre-Islamic, pagan and pantheistic belief systems that can be particularly discovered within the Kirmanc. “…[T]he battle of Tschaldiran (Province in North-West Iran) on 15 August 1514, between the Ottoman Empire and the Persian Empire, which ended with the victory of the Sunni-ruled Ottoman Empire, was the historic breaking point for the Anatolian Alevis and determined that they would become Shiite. Shah Ismail, Emperor of Persia and the leader of the Safawi Dynasty, had intensely close relations with the eastern Anatolian Alevis. As did his father and grandfather, he tried to annex Anatolia to his empire. As a counter-balance to the increasingly Sunni-ruled Ottoman Empire, Shah Ismail established the other orthodox movement in Islam, the Shii’tism that became the state religion in Persia and also a big influence of Shii’tism within the eastern Anatolian Alevis. Although Shah Ismail grew up and was socialised within the Kızılbaş-Alevi rite, its non-hierarchical and less institutionalized and non-orthodox character did not seem useful in ruling a big empire. This historic moment for Alevism, resulted in simultaneously combining pagan and pantheistic elements with ancient, pre-monotheistic spiritual elements and the elements of the monotheistic religions, above all from the Shīʿah rite of Islam” (Arslan 2012). Historian Erdoğan Aydın defines Alevism as a version of Islam that is shaped to a humanist frame and a religious culture that has developed itself due to a oppositional attitude against the central rulership of the Ottoman Empire (Aydın 2010: 388; Arslan 2016: 97). After the battle of Tschaldiran, Alevis suffered harassment, massacres, pogroms and oppression by the Sunni-ruled Ottoman Empire and the Ottoman Emperor Yavuz Sultan Selim I.. The threat of forced assimilation and withdrawal went hand in hand. Above all, the Kırmanc primarily found protection in the mountains of Munzur until 1935. This protection and withdrawal seemed to make possible the preservation of wide-ranging, pre-Islamic belief elements. Still Shīʿah Islam has a strong influence, but many people such as Dr. Daimi Cengiz argue that the cult of the Twelfth Imam is just symbolic. Indeed, Imam Ali represents more humanist typologies than the historical figure of Alī ibn Abī Ṭālib. For example, he represents love, justice, and peace, and also plays the role of the patron saint for all Alevis and especially for the KIrmanc. In Dersim, the Kırmanc recognise the spirits of the trees, rivers, mountains, sun, moon, animals and nature. “…[T]he Alevis regularly make pilgrimages to holy places, places of worship, Ziyaret. These places are mostly on high mountains and in caves. Some are burial plots of people, who are supposed to be Ermiş” and “[a]fter every visit to the Ziyaret, mostly the Alevis give some sacrificial offering, which is called Lokma or Niyaz to the ghosts, to the birds and animals and also to the homeless persons there and in the surroundings”. (Arslan 2012) Lighted candles are left in every Ziyaret for the souls of the dead. The regular Cem-gatherings every Thursday night can be defined as a kind of divine services and were originally realised within the Kırmanc, sometimes in the languages of Zazaki and Kurmanci too. Because of the difficult political conditions, the use of Zazaki and Kurmanci was suppressed in favour of Turkish. Dersim, seen as the stronghold of the eastern Anatolian Alevis, is characterised by its non-Sunni and non-Turkish identity. The Dersim inhabitants fear discrimination and violence by Kurds because most Kurds belong to the Hanefi-Sunni and partly to the Schāfi-i rite of the Islam. Most elderly Dersim population believe that “if the Kurds have had the chance they would kill us.” They point to the Kurdish clans’ solidarity with the Ottomans in the battle in Tschaldiran and the absence of Kurdish support during the Dersim and the other Alevi massacres. For example, the stronger and more radical practice of the Islam within the Kurdish population increases fear about new discrimination against Alevi. The same Alevi uncertainty can be found with regards to the neighbouring Sunni-Zaza people. The Armenian scholar Victoria Arakelova defines the Alevis as a “religious ideology spread among various ethnic groups” (Iran and Caucasus Studies Journal 2010). She does not assert that there is a “unifying vector”, but she simply identifies “the belonging (sometimes formal) of self-awareness” (Arakelova 2010: 14). Another very important point in Arakelova’s research is “endogamy” within ethno-religious groups. The ethno-religious perspective analyses the connection to and relative priority of religious items aside from the ethnic belonging. Arakelova writes, “The presence of such groups in different ethnoses indicates their sub-ethnic character, as well as the initially supra-ethnic character of the doctrine itself” (Arakelova 2010: 6). Another very important issue regarding the definition of Alevism is that the Alevis do not proselytise and thus do not need to formally explain their beliefs to the outside world. After the Dersim Genocide in 1938, a deathly silence somehow dominated Dersim. When the Turkish socialist movement of 1970ies became active in Dersim, the region’s rebellious aspect emerged again. The Kurdish movement dominated Dersim after the second half of the 1980s and into the 1990s. From the second half of the 1990s and particularly after the beginning of the 21st century, that region’s socio-political developments were shaped by a renewed return to the Kırmanc identity, above all in the European diaspora. Again, Dersim functions as an important battleground between the Kurdish movement and the Turkish government. Furthermore, this region is threatened by the Turkish government’s construction of hydroelectric dams. These dams destroy the Ziyaret of the Alevis and also devastate the culture, faith and life style of the Kırmanc. The Kırmanc consider this development as a new way for the Turkish regime to eliminate that region’s people, spirit and culture. Due to different assimilation politics of the Ottoman Empire and the Turkish Republic and faced with the strong Kurdish movement, the Kırmanc seem to have missed at least three opportunities: the option of maintaining their mother/first language Zazaki, the option of clearly defining and living their Alevism beliefs and the clear definition of their ethnic affiliation. In summary, the Kırmanc face a challenging identity crisis. The religious scholar Martin Baumann writes: “… a diasporic situation shall be qualified by a group of people which perpetuates a recollecting identification with a fictitious faraway existent geographic territory and its cultural religious traditions. Emphasis is placed on the enduring, often glorifying identification with a cultural-religious point of reference outside the current country of living”. (Baumann 1995: 100) The director of the Max-Planck Institute for the Study of Religious and Ethnic Diversity, Steven Vertovec, defines the diaspora as a “tripolar interrelatedness”, which means that diaspora groups are denoted by a reciprocal inter-relatedness of collective self-definition, country of emigration and homeland (Vertovec 2000: 4). The social scientist Robin Cohen determines nine criteria for the definition of a diaspora group: 1. dispersal from an original homeland, often traumatically, to two or more foreign regions; 2. alternatively, the expansion from a homeland in search of work, in pursuit of trade or to further colonial ambitions; 3. a collective memory and myth about the homeland, including its location, history and achievements; 4. an idealisation of the putative ancestral home and a collective commitment to its maintenance; 5. the development of a return movement that gains collective approbation; 6. a strong ethnic group consciousness sustained over a long time and based on a sense of distinctiveness, a common history and the belief in a common fate; 7. a troubled relationships with host societies, suggesting a lack of acceptance at the least or the possibility that another calamity might befall the group; 8. a sense of empathy and solidarity with co-ethnic members in other countries of settlement and 9. the possibility of a distinctive creative, enriching life in host countries with a tolerance for pluralism (Cohen 1997: 26). The more suitable conditions in Europe enabled the Alevis to live and develop their identity, which has been oppressed and threatened in their homeland, Turkey. Within their migrant existence, Alevis established associations to practice their faith and to socialise with each other. For some years, the members of the Alevi associations in the Western European diaspora recognised the need to institutionalise their faith to keep it alive and to transmit it to the new generations. They began to intensively discuss the position of Alevism to Islam; above all, because of the demands for official recognition by the Alevi associations within the Western European diaspora. The influence, the relevance and meaning of the Islam within the Alevism still raises many questions. In a Sunni-dominated Turkey, the distance or the nearness of Alevism to Islam has never been discussed as strongly as in the European diaspora. The more democratic conditions in western Europe prompted some circles within the European Alevi population to move away from or keep a distance to Islam (Arslan 2016: 186). While this is an Alevi phenomenon practiced in the European Diaspora, it is not possible to make so within a Turkey regarding the Sunni-Orthodox hegemony and rulership. While there is a general political demand to not be dependent on Sunni-Islam-ruled institutions such as the Turkish Presidential Department for Religious Affairs in Turkey (Turkish: Diyanet İşleri Başkanlığı) or the Islamic Religious Community in Austria (German: Islamische Glaubensgemeinschaft in Österreich, IGGiÖ), the Alevis encounter difficulties when defining their position to Islam because they do not practice any of the five pillars of the Islam. In Turkey, the assimilation pressure is too big to ignore. However, in western European states, the Sunni- Islam institutions themselves encourage the Alevis to go their own way if absolutely necessary. Finally, some Alevi circles in the European diaspora demand to be accepted as some kind of confession within Islam – as happened in Austria. The Austrian authorities included the Alevis in the new Islam Act of 2015, because of the efforts of the Islam-Alevi Religious Society. Not all the Alevis agree with that development, above all the eastern Anatolian Alevis, who mostly seem to be organised within the Confederation of the Alevi Associations in Europe (AABF) and the Democratic Alevi Federation (FEDA) (Arslan 2016 b). In Austria, the Alevi associations are challenged to define their faith in distinction to the officially accepted Islam Religious Society, and this situation causes disputes within the European Alevi associations themselves. From the beginning, all attempted to define Alevism within a relationship to Sunni Islam. During the whole recognition processes of Alevism in Europe, Alevism, both from the side of Alevi stakeholders and from the side of the responsible European institutions, was set in relation to Sunni Islam. One development shall be mentioned here, which was a result of the recognition of the Islam-Alevi Religious Society in Austria: The power of the IGGiÖ got broken. Now the IGGiÖ is no longer the only and one representancy of the Muslim population in Austria any more (for details about the recognition process, look at: Arslan 2016). A definition and fulfilment of the content of Alevism without using the principles of Islam does not seem possible. The achievements of the European Alevi diaspora inspire the Alevi stakeholders in Turkey to demand their democratic rights. At the same time, the discussion about the question of whether Alevism belongs to Islam or not, which dominates the European Anatolian Alevis daily routine, appears suspect and alarming to the Alevis in Turkey. “The concealment of the apprenticeship within a regime where they were in danger was a priority (Turkish: Takkiye) and led to a life in territorial and social isolation. Only people who were born into the Alevi circle had the chance to be part of and to gain knowledge of Alevism” (Kehl-Bodragi 1992: 2). The Anatolian Alevis had a somehow critical position to the orthodox Islam of the Ottoman Empire, but they did not really question their own position to Islam. To the contrary, the more they were harassed as nonbelievers within a Sunni Islam dominated empire, the more they searched for protection in Islam that was represented by the Persian Empire. Some attempts to establish an Alevi party in Turkey were unsuccessfully attempted under Mustafa Timisi with the Birlik Parti’si (1966-73) and Türkiye Birlik Parti’si (1973-81). All the political parties in the Turkish Republic have been aware of the big voting potential of the Alevi population in Turkey. Above all, the Republican People’s Party (Turkish: Cumhuriyet Halk Partis’i, CHP), as the so-called protector of laicism in Turkey, has greatly profited from the Alevi votes. Since the increasing power of the AKP hinders a transparent and sustainable democratisation process in Turkey, the eastern Anatolian Alevis have more obviously supported Kurdish issues and the pro-Kurdish Democratic People’s Party, HDP. An important development revealing the positions of the European Anatolian Alevis, in contrast to the Anatolian Alevis in Turkey, happened when the president of the Confederation of the Alevi Associations in Europe, Turgut Öker, declared his candidacy for independent deputy in the parliamentary elections of 2011 in Turkey (Arslan 2016: 127f). The Alevis in Turkey, due to their own socio-political conditions, did not welcome this step and once again supported the Republican People’s Party, CHP, to maintain a balance against the AKP. The cofounder of post-colonial studies, Gayatri Chakravorty Spivak, notes that this “opportunistic action” was to gain entrance to the centre and achieve “attractive privileges” such as at least avoiding new massacres, while marginalising itself and keeping ahead and reproduce the “Centre/Border-Dualism” (Varela 2003: 276). The situation of the Alevis and the Alevism cannot be understood without analysing their attitudes and survival strategies, which are sometimes seen as opportunistic (Arslan 2016: 73ff). According to political conditions and their survival struggles, the Alevis take particular positions. The CHP always seems as a protector for them to prevent the takeover of Islamic power in Turkey. Recently, the HDP seemed to promise democracy, diversity, equality and justice in Turkey. On the one side, because the relationship of Alevism and Islam is still not clear, this polemic will probably continue. No Alevi stakeholder can clearly answer the question “Who is an Alevi and what is Alevism?”, but their responses will undoubtedly contain information about the massacre and harassment of Alevis and Alevism in Turkey, the common traumatic memories, the inequality and disadvantaged position compared to Sunni Islam followers within the Turkish Republic, etc. These are mainly political issues that are emphasised because of fear and worry about new massacres in future assimilation actions. The Alevi Associations’ solidarity with the Kurds in Turkey and in Europe focuses on a democratisation process in Turkey and equality for everyone. An important part of the Alevis also fear oppression and massacre through the Schāfi-i Muslim Kurds in a possible Kurdish territory (Erman, Tahire; Göker, Emrah 2000: 100). As long as scholars cannot define and determine an Alevism as an independent belief system apart from Islam, a subordination and assimilation to the Islam seem to be inevitable in the long term. However, the Zazaki speakers – because of many external and internal reasons – have not developed their own ethnic identity, but more and more Zazaki speakers now point to their differences to the Kurdish culture and the Kurds. Currently the linguists agree that Zazaki is its own language, but they do not want to answer the question if the Zazas are their own ethnicity or nationality distinct from the Kurds. Mostly they argue that this is a political decision (personal communication Heiner Eichner and Ludwig Paul). Besides the question of whether movements or declarations about nationality are really relevant in the 21st century, the issue remains of criteria, existing possibilities and conditions for forcing demands to establish a “Zazaistan” (terminology for the first time ever used by Ebubekir Pamukçu 1992). Due to their economically poor position and their non-Turkish ethnic background, the eastern Anatolian Alevis belong to the most emigrated people, since the beginning of the 1960s, to the Turkish metropoles and the European diaspora (Kieser 2001). In addition to the political conditions and context in the homeland regarding the Kurdish movement, important issues include the ongoing debate on a definition of Alevism, revitalising the Zazaki language and strengthening self-identity processes within the diaspora existence. While some marginalised Zazaki speakers have attempted to promote a Zazaki nationality, another larger group seems to try to rescue the Zazaki from the embrace of the Kurds. The largest group of the Kızılbaş-Alevi Zazaki speakersdo not really seem aware about or interested in their ethnic identity, but prefer to hold on their eastern Alevi identity and another part seems to favour the Kurdish movement. Perhaps the focus on the religious identity could also support the development of the language. In summary, beside of some nationalist attempts of some few protagonists, above all in the diaspora, it can be observed that for the Kızılbaş-Alevi Zaza population, the religious ethnicity (Kızılbaş-Alevi) is currently more dominant and emotionally more preceived than the aim to develop a national ethnicity yet (Arslan: Identity building in diaspora. The case of the Zaza. Forthcoming soon). Altogether, more than before, it seems important that democratic Alevi stakeholders manage to define elements of a common identity and to focus on, at least, the humanist and key values of Alevism: namely, personal pacifism, social peace and equality. Besides the regularly performed commemoration rituals of the Alevi associations, on the one side, and their solidarity actions with the oppressed groups in Turkey, on the other side, it is time to establish a clear vision and perspective to an Alevi theology and Alevi politics that clearly defines its own purposes without external ascriptions and without worry about new massacres and assimilation. These goals can be reached when a self-confidence and belief in its own visions and aims can be established. The existing Alevi associations mainly practice cultural and social activities. Because the leadership positions within the Alevi associations are taken by former activists of the Turkish student and socialist movement of the 1970s, the Alevi movement is not able to develop new visions for the future and keeps looking to the past in its political practices. Considering the danger and worry about new massacres, continuing discriminations and oppressions, the Alevis generally failed to establish a strongly united political attitude and organisational membership. Because the main criteria in the Alevi faith is personal pacifism, the estimated 25 million Alevis living in Turkey must be able to clearly and effectively set a political programme to develop democracy and peace. Independent of whether Alevism is officially accepted or not, the more stable that democracy becomes in Turkey, the more chances Alevis could have to survive and live without fear and discrimination. Arslan, Zeynep. 2016. Eine religiöse Ethnie mit Multi-Identitäten. Die europäisch-anatolischen Alevit_Innen auf dem Weg zur Institutionalisierung ihres Glaubenssystems. LIT Verlag. Wien. Baumann, Martin. 1995. Conceptualizing Diaspora. The Preservation of Religious Identity in Foreign Parts. Exemplified by Hindu Communities outside India. In: Temenos. 31. 19.35. Bumke, Peter. 1979. Kızılbaş Kurden in Dersim (Tunceli, Türkei). Marginalität und Häresie. In: Anthropos 74. Cohen, Robin. 1997. Global Diasporas: An Introduction. London. UCL Press. Erman, Tahire; Göker, Emrah. 2000. Alevi Politics in Contemporary Turkey. In: Middle Eastern Studies 36. Nr. 4. Kehl-Bodrogi, Krisztina. 1992. Vom revoluntionären Klassenkampf zum wahren Islam. Transformationsprozesse im Alevitentum der Türkei nach 1980 (Sozialanthropologische Untersuchungen 126). Berlin. Johanson, Lars. 1988. Grenzen der Turcia. Verbindendes und Trennendes in der Entwicklng der Turkvölker. In: Ulla Ehrensvärd (Hg. ): Turcica et Orientalia. Stockholm. Leiser, Gary. 1988. A History of the Seljuks. Ibrahim Kafesolğlu’s Interpretations and the Resulting Controversy. Carbondale. Pamukçu, Ebubekir. 1992. Dersim Zaza Ayaklanmasının Tarihsel Kökenleri [Historical background on the Dersim Zaza Revolts]. Istanbul. Vertovec, Steven. 2000. Religion and Diaspora. Institute of Social & Cultural Anthropology. University of Oxford WPTC- 01- 01. Ja’fari is the third tendency, besides the Ismailis and the Zeydis, in the Shīʿah rite of Islam. The Jaferi are not generally recognised by the Sunni-dominated Islam world because of their strict position against the first, second and the third Caliphs in Islam, who did not support the succession, after the death of Prophet Mohammed, by Imam Ali, who was the fourth Caliph. Today, the Iranian state follows this tendency of the Shīʿah rite of Islam. In Turkey, the most popular leader of the Ja’fari school is Selahattin Özgündüz, who strongly favours the current Iranian regime. While different Alevi groups are defined by different names such as “Tahtacı”, “Abdal” or “Çepni”, the eastern Anatolian Alevis can be defined as the “Kızılbaş”. “Kızılbaş” has been a curse against the Alevis for a long time. The eastern Anatolian Alevis antagonised the Ottoman rulers through their solidarity with the Persian Empire. Some say that as a result, these Alevis are called “Kızılbaş”, because their ancestors wore red caps (Turkish: kizil başlık), when they fought on the side of Shah Ismail against the soldiers of the Ottoman Sultan Yavuz Sultan Selim in 1514. I argue that “Kızılbaş” is the name of the eastern Anatolian Alevis and strongly points to their oppositional political positions against the central-rulerships (Arslan 2016: 85). Based on the priorizing of the religious belonging within the Anatolian Alevi population, here it seems to be meant that the Kırdaşi are Kurds, but first of all Kızılbaş-Alevi. So in this point of view altogether they are “like Kurds” or “Kurdish-like” (Turkish: Kürdümsü), but in any case they are Alevi first for the Kızılbaş-Alevi Zaza. Also called KIrmancki, KIrmanci, DImIlki, Zonê Ma (note: depends on the regional origin of the local speakers) is an ancient language that belongs to the Indo-German language family of the West-Iranian group. An interesting discussion raises the question of whether Zazaki is a dialect of Kurdish or rather more a language of its own. 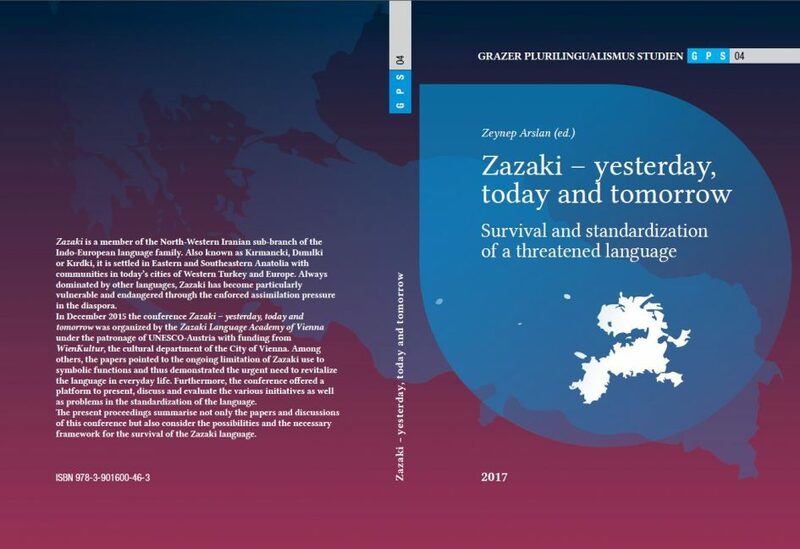 The linguists more and more agree that Zazaki is a separate language (for example: Mesut Keskin, Jost Gippert, Heiner Eichner, Ludwig Paul). The UNESCO Atlas of the World’s Languages in Danger 2009/2010 lists Zazaki as an endangered language along with Kurmanci (See: http://www.unesco.org/languages-atlas/index.php). On 25 December 1935, the Act of Tunceli (Tuncelı Kanunu) enabled the path to the Dersim Genocide 1937/38. Within the Alevis, Dersim is known as ‘Hardo Dewres’ (this is Zazaki). This means the earth/the place of the holy dervish. Interview with Anas Schakfeh (term of office 1987-2011) on 22 February 2010: The former President of the IGGiÖ completely rejected any association of Alevism with Islam. He did not reject Alevism as a religion, but appraised Alevism ‘diametrical’ to Islam: “The point is not an enmity or friendship. This is not the question. The point is not to downgrade it. I would never say ‘An Alevi is a Kafir (unbeliever)’. The point is that an Alevi is a member of another religion, like a Christian, a Jew, a Buddhist, a Hindu. […] An Alevi is a believing Alevi, but never a Muslim. […] That is why we never said that we are against the recognition of the Alevi religion (note: in Austria Z. A.). […] But never (note: a recognition Z. A.) as Muslims. That would mean that a governmental adjustment would take the right to name someone as Muslim or not. This is never the business of the state.” (Arslan 2016: 202).